MOSCOW, Russia -- A wave of savage mockery of Russian President Vladimir Putin has erupted across the internet, sparked by days of absence from public view, despite official insistence it was business as usual in the Kremlin. Vladimir Putin is not too keen on the joke. State television footage of Putin working at his residence failed to quell the tide of fantastical theories circulating online that the 62-year-old Kremlin leader had died, been deposed, or travelled to Switzerland to watch his girlfriend give birth. The hashtag #putinumer (putin died) began trending on Twitter, and a website, putinumer.com, offered readers advice on how to gauge whether the rumours were true. "Look out the window," it advised. "Are people rejoicing, dancing, letting off fireworks? No? That means he hasn't died yet." Putin is normally ubiquitous in state media, but his silence in the past week has fed rumours of a threat to his grip on power. While hard facts are scarce, there has been speculation of a split between rival Kremlin camps since the killing of opposition politician Boris Nemtsov near Red Square on February 27. 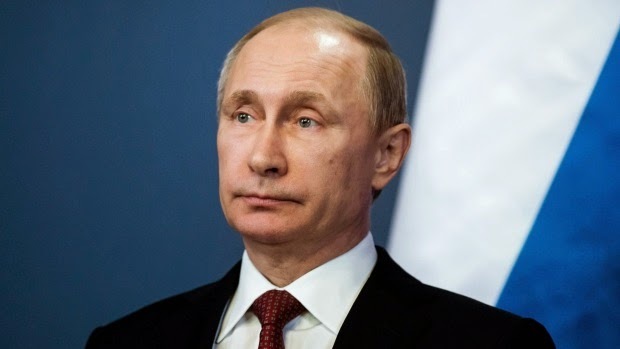 "Putin has died on purpose to distract attention from the murder of Nemtsov", tweeted Putin#Vor (Putin#Thief). The head of pro-Kremlin pollster VTSIOM said on Friday that his approval rating had hit an all-time high of 88 per cent. "Yes. We've already said this a hundred times. This isn't funny any more." RIA news agency separately quoted Peskov as denying that Putin had become a father again - a response to a flurry of speculation that former Olympic gymnast Alina Kabayeva had given birth in Switzerland. Putin flew to Switzerland to be with Kabaeva as she went into labour at a private clinic, Switzerland's Blick tabloid quoted local residents as saying. Dmitry Peskov, Putin's spokesman, told Russian Forbes magazine that "information about the birth of a baby fathered by Vladimir Putin does not correspond to reality". The Kremlin has regularly denied speculation of a romantic relationship between Kabayeva and Putin, who formally divorced his wife Lyudmila in 2014. In a surreal YouTube video which had been watched more than 93,000 times by Friday evening, two men in camouflage uniform are shown walking through a rubble-strewn landscape past Putin's gravestone, carrying a TV screen showing wild Cossack dancing. "Unbelievable things happen in the world," they sing. "You would think the people will mourn, but the earthlings celebrate, all the continents conduct parades, America is happy, Europe is happy." Theories sprang up to explain why the president this week postponed a meeting with the leader of Kazakhstan - one suggested he was meeting Muammar Gaddafi and Hugo Chavez, the deceased Libyan and Venezuelan leaders. A spokesman for President Barack Obama was asked aboard Air Force One whether the US government had any information on Putin's whereabouts or whether Obama had been briefed. "I have enough trouble keeping track of the whereabouts of one world leader," White House spokesman Eric Schultz told reporters. "I would refer you to the Russians for questions on theirs. I'm sure they'll be very responsive."